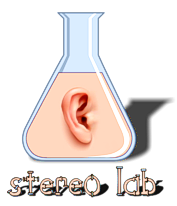 Stereo Lab - What's wrong with ordinary stereo? How stereo works, and what's wrong with it? and how recordings are made. Everyone knows, of course, that sound is waves in air, and that low frequency sounds have long wavelengths and high-frequency sounds have short wavelengths. But most people are surprised by the dimensions of the waves. For example the lowest note on a bass guitar has a wavelength of 8.5 metres and the wavelength of the highest frequency you can hear is less than 2 cm! That's a massive range and, because music has sounds at all frequencies, we have to care about what happens to all these waves. To cope with this, evolution has given us two different processes for determining the direction of the massive tsunami waves of the bass to the tiny ripples of the extreme treble. In fact, the theory of directional hearing is based upon recognising that there are two directional hearing systems; something called Duplex theory which originates with Lord Rayleigh at the turn of the twentieth century. 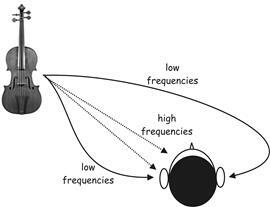 Duplex theory explains how we have a system for the perception of the direction of low-frequency sounds and another system for the perception of high-frequency sounds. Lastly, we have to understand that the stereo picture is built up in a studio by mixing the signals from the microphones and steering them to a place within the stereo image by means of a panoramic potentiometer or pan-pot. The pan-pot positions the contribution from a particular channel in the stereo picture by the ratio of signal it sends to each channel. So, at the extreme anti-clockwise position, the entire signal is sent to the left channel and the contributing microphone signal will appear to come directly from the left loudspeaker. And at the extreme clockwise position, the opposite will be the case, so that the signal will all be sent to the right channel and the microphone signal will all appear to come from the right-hand loudspeaker. In between there is a progressive relationship so that, as the pan-pot knob is turned clockwise gradually less signal gets sent to the left, and more to the right and the microphone signal appears to move across the stereo field. In the middle of the pan-pot's travel, equal amounts are sent to right and left and the signal appears to come from the centre of the image . Now, you might be a bit surprised, given that we humans possess two hearing systems, one for high frequencies, and one for low frequencies, that such a simple method of constructing a stereo image with a pan-pot wouldn't provide a perfect illusion..... And you would be absolutely right! 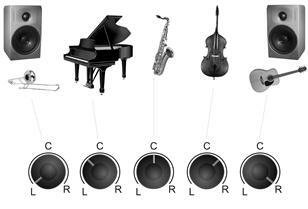 Essentially a pan-pot steers the low-frequency sounds into one position in the stereo image, and steers the high frequencies to another position. Honestly, the positions are quite close, and that's why stereo has done without a FRANCINSTIEN type process for 50 years! But, now that modern audio equipment is so good, this stereo-image anomaly is one of the last aspects of sound reproduction we really must improve. So that's what FRANCINSTIEN does: it processes the normal left-right signals of a stereo recording and adjusts the way low-frequencies and high-frequencies are sent to the left and right loudspeaker in such a way that the low-frequency sounds form at exactly the same position as the high-frequency sounds; not just "somewhere close". For the mathematically minded we can plot the positions that a pan-pot will steer high- and low-frequency sounds into the stereo image according to its physical position. The upper graph below illustrates the position to which the high and low frequency sounds are steered in a conventional pan-pot. The y-axis illustrates the position (marked from the centre 0, to 30 degrees, which is the edge of the stereo image field. Note how the high and low frequencies do not align for a given left-right channel ratio (indicated in dB ratio) on the x-axis. The lower graph illustrates the effect on the high and low frequency image when the FRANCINSTIEN correction matrix is employed. Note how the high-frequency and low-frequency images are perfectly aligned. The result is a transformation in the solidity of the stereo image, so that the high and low frequency components of the instruments "lock-in". Voices and instrument take on a precise position in the image and reverberation takes on a 3D character. If this is a fundamental problem with stereo, why hasn't anyone thought of it before or tried to do anything about it? They have! The inventors of the stereo system (Blumlein and the EMI team in the UK) realised this problem when they invented the practical stereo system back in the nineteen-fifties. They even invented a circuit (like FRANCINSTIEN) to correct for it. They called it The Shuffler. But their Shuffler suffered from a poor circuit implementation and it caused other problems with frequency response and distortion, so it was dropped. And that has meant that the stereo system has been "broken" for over sixty years! But that is another story. You can read about that story elsewhere in these help files.